Leora Fridman is a writer, translator and educator living in Massachusetts. Her recent and forthcoming publications are included in Denver Quarterly, Shampoo, Sixth Finch, H_NGM_N, and others. 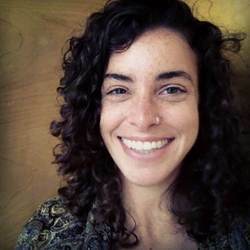 She is an MFA candidate at the UMass Amherst Program for Poets and Writers where she is an Assistant Director of the Juniper Institute and co-curates the Jubilat/Jones Reading Series.